Although I'm sure most of you have seen it already, this is pretty cool. Boba Fett's first appearance ( pre holiday special). You can even see the original paint scheme that didnt make in to the film with the two eyes painted on the helmets forehead. 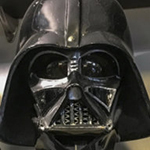 Also by this point Vader's ANH helmet seems to have already been re-painted. Cool. I hadn't seen that video before. I've only seen photos of the event. Nice to see more of the original ANH Vader out on tour.